With so much to see, eat and sip in the charming village of Carmel-by-the-Sea, it can be hard to know where to begin. 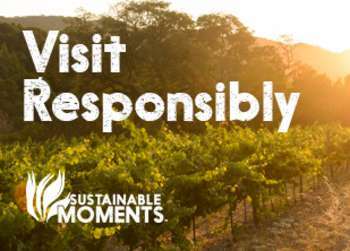 You could easily spend an entire week eating in different restaurants, sipping wine in various tasting rooms and appreciating art in the numerous galleries. 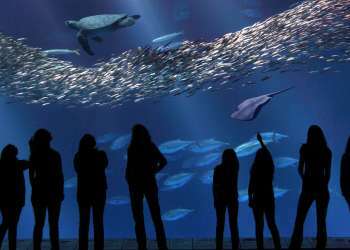 If you only have an afternoon to spend in Carmel-by-the-Sea, then consider the itinerary below. 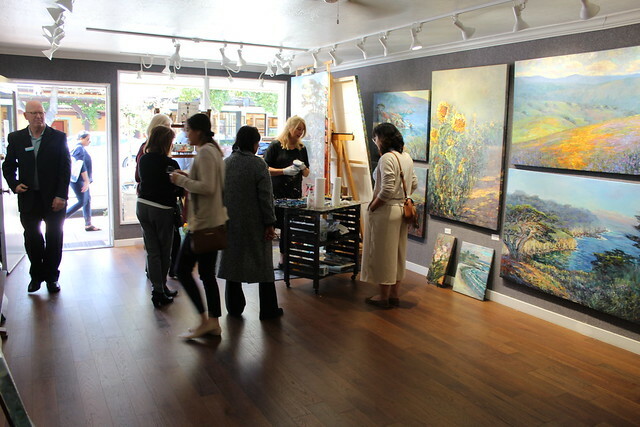 Start your afternoon off with a guided Carmel Art Tour (click here to book a tour in advance). This walking tour is a great way to see some of the best exhibits and artists in town with your own personal local guide. 90-minute tours are informal but informative, and guests stop at a handful of galleries where they have the opportunity to meet the actual artists or gallery owners. During a recent afternoon tour, our guide was Rohana LoSchiavo, the founder of Carmel Art Tours. Rohana’s relationships with local artists and owners made each gallery approachable and personal. 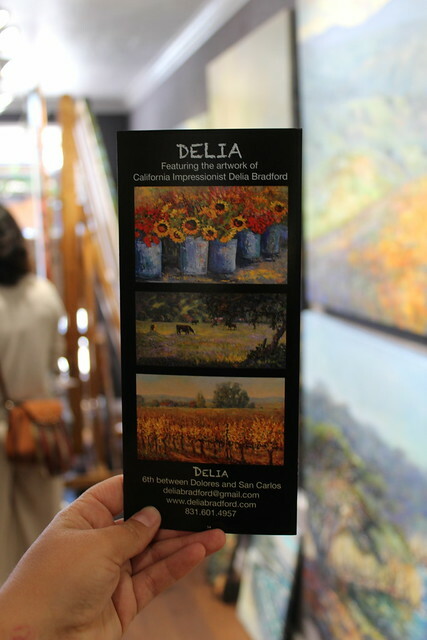 We started our tour at Delia and had the chance to see local artist Delia Bradford working in her studio. Her large scale impressionist paintings were impressive to say the least. She also kindly makes adorable small reproductions so that anyone can afford to take home one of her picturesque Californian landscapes as a souvenir. From there, we walked a block over to Westbrook Modern. As you step inside Westbrook Modern, you feel as if you are in an art museum in London or New York. They offer noteworthy works by artists who have made significant contributions to American art and are featured in international museum collections. Our next stop was Steven Whyte’s Sculpture Studio & Gallery. 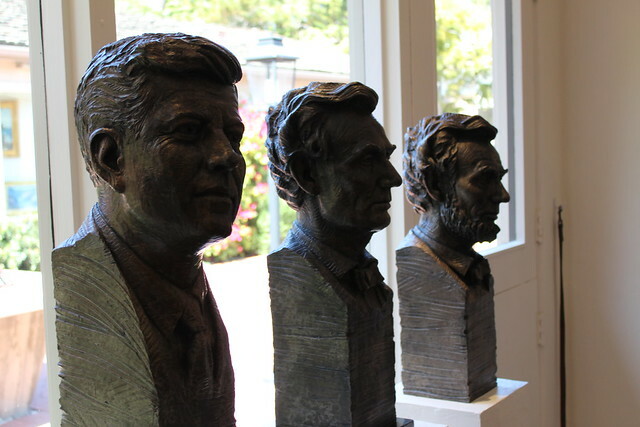 Whyte is a classically trained sculptor who creates impressive life-like sculptures, many on a very grand scale. He is the artist behind the Cannery Row Monument at Steinbeck Plaza and he also has public monuments throughout the world. We then strolled over to Gallery Sur which features photography of the Monterey Peninsula as well as paintings and sculptures. The owner and artist, David Potigian, was very welcoming and even offered us fresh homemade chocolate. Our group then weaved through hidden courtyards and secret passageways to the New Masters Gallery, another museum-esque gallery. To our surprise, artist Gordon Mortensen was in the gallery chatting with the owners. Casually encountering such a renowned artist was the perfect ending to our walking art tour. After our art tour, it was time to rest our feet, and Silvestri Vineyard’s Tasting Room was just the place! Silvestri Vineyards is owned by composer Alan Silvestri, who composed the scores to countless films from Forrest Gump and The Bodyguard to recent releases such as Ready Player One and Allied. The familiar soundtracks played in the background as we sipped varietals from Silvestri’s Vineyard. 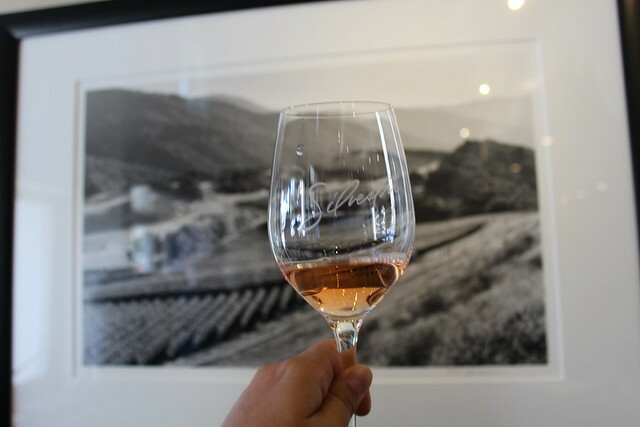 I really enjoyed the pinot noir rosé (#roséallday) as well as the late harvest chardonnay. The music brought back fond memories and paired excellently with the estate, small batch wines. No trip to Carmel-by-the-Sea is complete without a nosh from one of its cozy restaurants. Our group opted to go around the corner to Vino Napoli to check out their recently revamped wine bar. 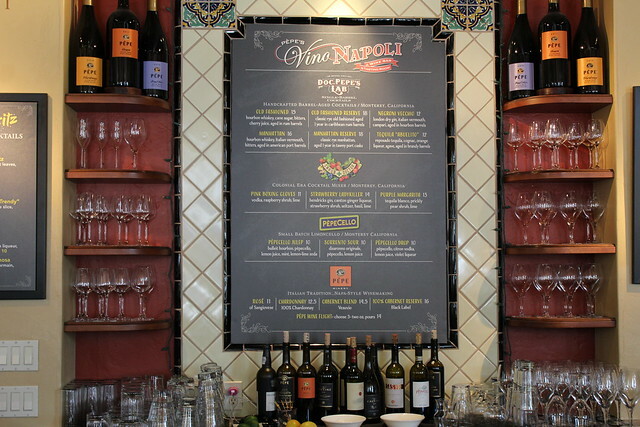 Located just across the courtyard from Little Napoli, Vino Napoli is much more than a wine bar. It features a great full menu, numerous tables from intimate two tops to our table that comfortably held 10. It is also the perfect spot to catch the game on its four large flat screen televisions. 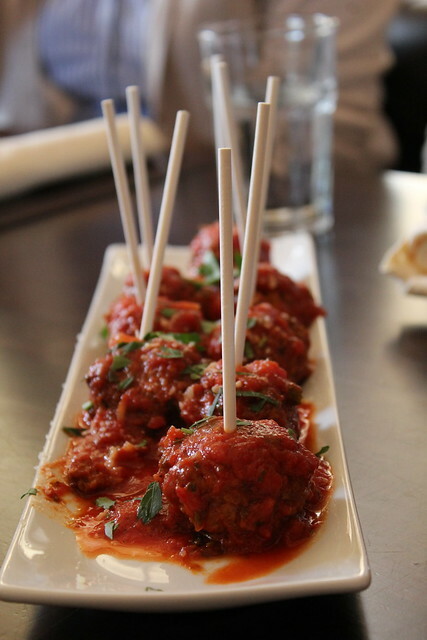 Our group devoured the meatball lollipops, arancini lollipops and the fried artichoke lollipops; all of which are on the appetizer menu and perfect for sharing. We then shared a veggie Napoletana pizza and a spicy Diavola pizza for the carnivores in the group. The meal paired perfectly with their extensive wine selection. Pro tip: Vino Napoli offers wine flights as well as cocktail flights! 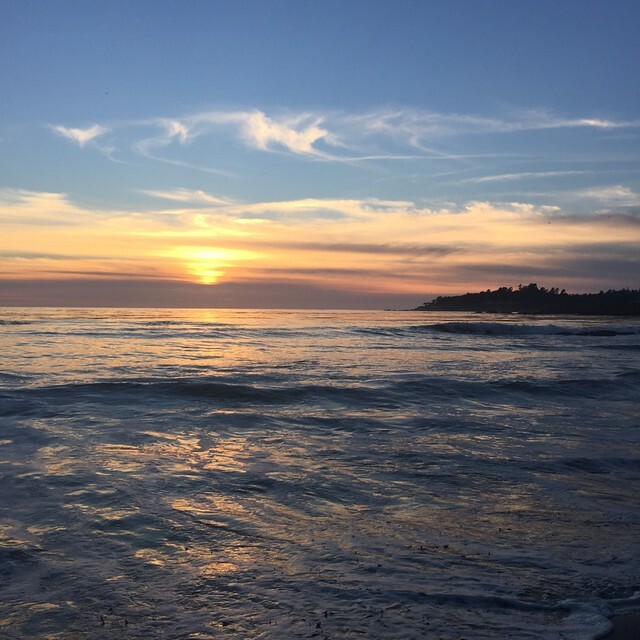 If you have the energy after an already busy afternoon, then end the day with an epic sunset at Carmel Beach. Test your own inner artist and capture the perfect sunset shot, worthy of its own exhibit!